Geoff Packard as Candide in the Shakespeare Theatre Company’s production of Candide, directed by Mary Zimmerman. Photo by Liz Lauren. Wait, have I said “romp” this year? I’m firmly in favor of limiting certain over-used review words and “romp” for sure appears in the rogue’s gallery. Well, let’s err on the side of caution, shall we? Hoo boy, well that just screams fun, don’t it? Well, it is, and if it lacks a little bit of the depth and gravitas – another over-used review word! – that we often see on stage at the Harman, well, I’m okay with that this holiday period. Let me tell you why. 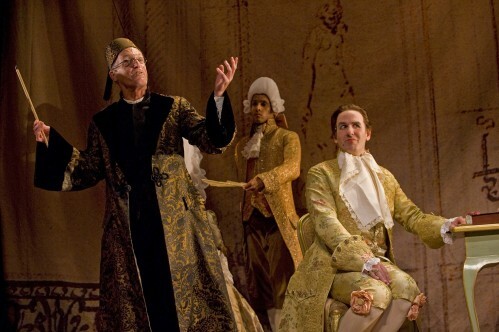 Larry Yando as Pangloss, Govind Kumar as a servant and Erik Lochtefeld as Maximillian in the Shakespeare Theatre Company’s production of Candide, directed by Mary Zimmerman. Photo by Liz Lauren. Let me be up-front about this: part of what hooked me in Candide is the same thing I enjoyed in Zimmerman’s Argonautica – a way of presenting the scenery and action that is very stage-specific. Model boats held up in in a puppet style on sticks “float” along the background to represent ships in the distance. Ropes stretch from above, held by actors portraying nameless sailors, and are whipped about to set the scene on a storm-tossed and tragic journey by boat. A field of colorful tulips sprout up all over the stage when Candide is in a city of pastoral beauty. Meaning it hits my sweet spot: it does something uniquely theatrical rather than attempting to out-television television. If you want perfect veracity and 3D Avatar-like immersion… this is not it. But it’s lovely and unique and done to proper effect. In the beginning, when Candide is being raised and instructed in a perfect world the scene is sterile and confined – it resembles a shoebox diorama and is a tight view with little depth. When he is put out of this world, in defiance of the optimism and expectation that all is as it should be, suddenly the stage is huge and open, and it never returns to that confined but safe space. Everything is dangerous and unpredictable and varied – sometimes wonderfully, often terrifying. Lauren Molina as Cunegonde, Hollis Resnik as the Old Lady and Spencer Curnutt and Tom Aulino in the Shakespeare Theatre Company’s production of Candide, directed by Mary Zimmerman. Photo by Liz Lauren. 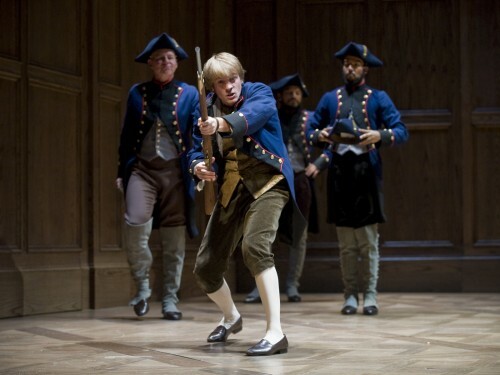 The acting in Candide is also somewhat large and stylized, but on-target for a farce. Largest among the cast is Hollis Resnik as the character only ever referred to as “Old Lady,” the most practical character throughout and also the least likely to put up with any nonsense. Larry Yando’s Pangloss, on the other hand, is pretty much the epitome of nonsense… or at least denial. His adherence to the belief that this is “the best of all possible worlds,” and that everything is a tautology: if this is how it is, then this must, by definition, the best way it could be. A side note here: in what is a pretty impressively ironic effort, the artistic staff seems to be in cahoots with the catering operation in offering a drink they call “the best of all possible cocktails” at the bar. Just as the world Candide inhabits is by no means the best of all possible worlds, this drink is in no way the best of all possible cocktails. Just like Candide’s life, it is a bitter mockery of perfection and requires effort to stomach. Just order a beer at intermission if you know what’s good for you. Everyone else on the cast does a nice job, including leads Geoff Packard as Candide and Lauren Molina as his love interest, Cunegonde. Packard does about as well with Candide’s emotional journey as he can – this is a fairly simple bit of myth, following Candide through the process of learning that there’s a practical middle ground between foolish optimism and complete pessimism. The lesson is that life requires some effort both in tending the practical and the metaphysical, and the show wraps that up with a pretty little bow and hands it over. It even uses the not-remotely-subtle metaphor of farming. It’s not the deepest philosophical stance anyone ever took and it Packard works within its somewhat confining structure. 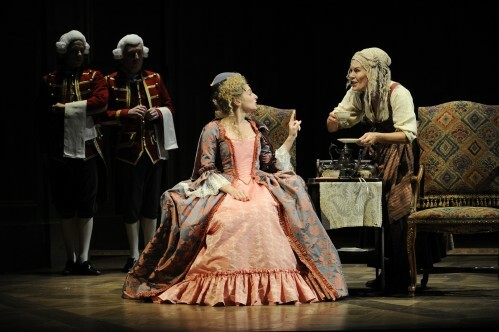 Hollis Resnik as the Old Lady and Lauren Molina as Cunegonde in the Shakespeare Theatre Company’s production of Candide, directed by Mary Zimmerman. Photo by Liz Lauren. Molina gets to run the full gamut of emotions and situations and her part is the better for it. She does a nice job of making Cunegonde human and likable even when she’s portraying someone who’s a bit shallow or living within a pretty distasteful situation not of her choosing. She’s believable in the high points and low, and a lovely singer. “Feel good” is another review cliche, but that fits here too, despite the dark comedy winding its way through the show. You’re not going to walk away from Candide with any metaphysical matters to ponder but you’ll probably have something new to hum and a smile on your face. edit@4:30 – Thanks for the catch, Kate – even though I know better I have some sort of alcohol-induced dain bramage that makes me want to abbreviate STC as WSC (musta killed those particular brain cells with booze). I normally resist the urge to abbreviate and should have done so here. Just a quick correction. It’s Shakespeare Theatre Company not WSC. WSC is Washington Shakespeare Company and is a different organization.